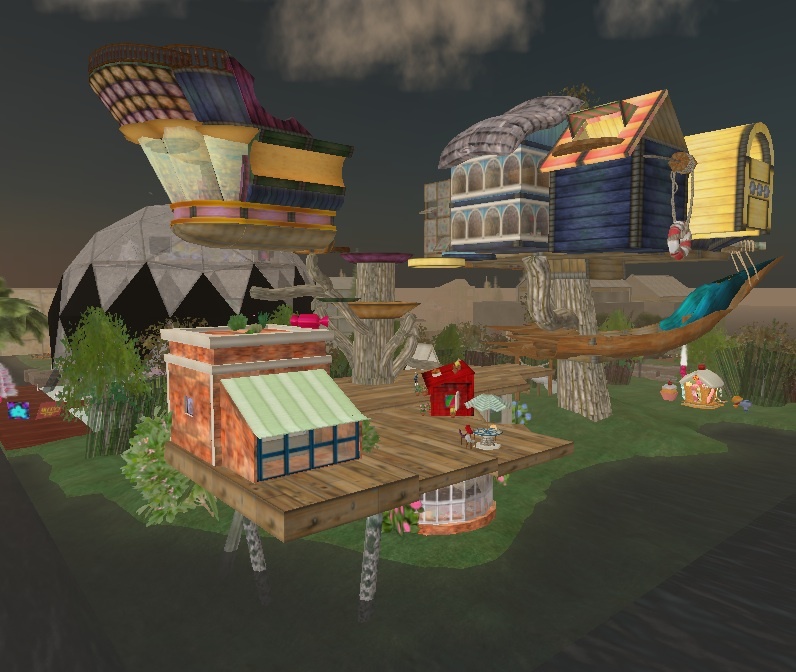 Why does much of Second Life remind me of Coleridge? Perhaps it's the dream-like quality, the thought that it all transpired in my head, and one day I'll wake up and find that it's disappeared into a wave of sun-struck sand like a mirage. Somebody had fun (Quinlan Quimby perhaps) when they built the Tree of Second Life main store on Firefly. Whenever I go somewhere in Second Life I ask myself, "what kind of story does this place tell?" In this particular case, my brain spun a wild tale about a gigantic little kid who disassembled a model boat kit and from its parts built a tree-house-candyshop thingie. Then the kid decided she wanted to be just like Alexander McQueen when she grew up, and threw in a little clothing store at the top. I love it here. I could spend hours staring at the faded wood textures and oversized sweets. Something about the doll colors and proportions (and the playfulness of the entire build) inspires me to bust out the Anatomically-Disproportionate-Plastic-Doll-Pink. And okay, I have a secret love for the color pink that hasn't gone away with age, although people tend to look at me funny if I dress like my two year old IRL. ***Hair: /artilleri/ sabrina *pink blonde*, (artilleri, 87, 118, 26). ***Skin: /artilleri/ lily (porcelain) *candy*, (artilleri, 87, 118, 26).